What do you do when you're a leading audio/video cable company in an era when many of your products are being made obsolete by technological change? If you're Monster Cable, you adapt by diversifying your product line and jumping into the emerging HDMI cable market with both corporate feet. HDMI is a single cable solution to the traditional rat's maze of audio and video cables that hang out behind one's stack of home theater components. When it works it's great, and it really does let you clean up much of the mess created by separate audio and video interconnects. And if you want to take advantage of 1080p high definition sources, whether they be Blu-ray discs or conventional DVD's up converted via today's newest generations of DVD players, HDMI is mandatory thanks to the Hollywood community's insistence that anti-piracy capabilities be built in. Yessirree, because some people pirate we all pay the price. But to companies like Monster Cable, the single wire solution means the days of selling up to eight separate cables to customers who want to play back 7.1 channels of uncompressed music or movie soundtracks are numbered. That's potentially a heckuva drop off in sales. Monster isn't taking this lying down, of course. The company's movers and shakers were in Vancouver, British Columbia, a while back and invited me there to have a look at how they plan to remain relevant – and profitable – in a changing marketplace. One way to remain relevant is to offer HDMI cables that are far enough ahead of current standards that if the still-evolving HDMI specification ever exceeds the capabilities Monster has built in already they'll replace them for free. They call it the Cable for Life Upgrade program and it applies to some of their Advanced for HDMI cables, including the new 1000 EX and M Series M1000 HD. Naturally, these aren't the cheaper models, and Monster undoubtedly doesn't expect to eat too many of them, so it's a pretty neat marketing strategy as well as good incentive for consumers interested in making their home theaters more obsolescence proof than the actual components they're connecting. This could be especially attractive to people installing cables where they won't be easy to rip out again down the road. The company's "speed rated" cables now come in five different ratings: Standard Speed, High Speed, Advanced High Speed, Ultra-High Speed – and the latest version, Ultimate High Speed, which is available on the M Series M1000HD. The M1000HD is a honey of a cable the company says will transmit uncompressed high definition video (1080p/60Hz and beyond), 12-bit color and all eight channels of digital audio over long distances. The latter point is especially handy if you have a front projection HDTV, which is the best way to watch home theater if you have the room for it. Monster sent me a 75 foot length of the real stuff, an Advanced HDMI 1000HD cable only a little thinner than our garden hose, to string between the Rotel RSP-1069 preamp/processor and the Epson Pro Cinema 1080p projector that are the heart of my home theater. That's a long hunk of wire, long enough to be known to cause problems with HDMI, which has been said to lose effectiveness sometimes in lengths over 50 feet. I was hoping the Monster cable would fix a problem I was having between the Rotel and a Panasonic PT-AE2000U front projector I was reviewing at the time, but it was not to be. It seems that no cable is going to help when two components simply refuse to talk with each other. According to "Head Monster" Noel Lee, "Screen resolution and color depth can be degraded by using long lengths of low-quality HDMI cables. M1000 HD performs even over long runs." Lee says his company is committed to staying at the leading edge of technology advances in cables and "to creating products that exceed current specifications, providing great performance even at long lengths." I don't really understand all the technish around this topic, so I'll take Lee's words at face value. And the Monster cable did provide rock solid connection between the Rotel and the Epson and between the PS3 Blu-ray player/HD PVR and the Panasonic projector. So the stuff does work, though some consider Monster products to be pricey. On the other hand, I don't know of anyone who's been forced to buy Monster products at gun point. It would make a heckuva movie, though! All the HDMI cables in Monster's Core, Monster/THX Ultra Home Theater and M Series lines feature "the Monster Speed Medallion System and Performance Bars" on their packaging. These are meant to tell you the audio/video features each cable supports (i.e. "Ultimate Audio 192/24 for lossless surround sound") so you can pick the one that's suited best to your needs. If you want to connect a conventional DVD player, for example, Monster will let you get away with a more "entry level" cable – as long as it's theirs! The company's also beefing up its line of PowerCenter power conditioners, components that are meant to ensure your beloved electronics get clean and stable electricity. Some of their new models let you operate your stuff via remote control even if the stack is in a different room or mounted inside a closed cabinet. They're also including pass-through capability, with built in surge protection and filtering, for people who access the Internet or their home network over their home's electrical power lines. Monster is also pursuing a slice of the high end headphone market. 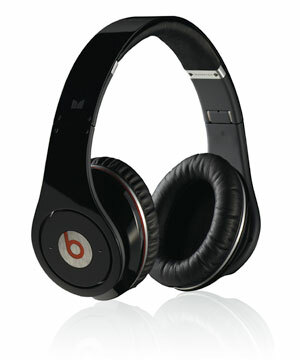 They refer to their "Beats by Dr. Dre" as "over ear speakers" rather than mere headphones – to create the image of headphones that are more suited to the recording studio than the airplane cabin. And for $500 they should be! I was shown a prototype and didn't have a chance to listen to it, but if nothing else it's a handsome product. I look forward to trying it out. Monster's even jumping into the software market with Monster Music, "super discs" that incorporate surround sound mixes you can listen to as if you're in the front row of the audience or on stage with the band. The discs also come with high definition digital files you can load onto your MP3 player, supposedly without sacrificing any quality. I only auditioned a couple of tracks on a demo disc, but they sounded very good. In a world in which DVD Audio and SACD are dying, it's nice to see someone carrying the "ultimate sound quality" banner. 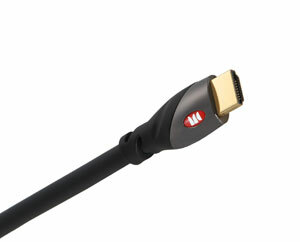 Add this to a complement of adapters and connectors for a variety of devices such as iPods and game consoles and, while future sales of separate audio and video cables may be in jeopardy, Monster Cable appears to have enough irons in the fire to ensure it continues being a well-connected power player in the world of home theater.